Cooperative stations are the union of several stations, connected to different ways. Large station is a conjunction of two small stations, but they are connected to one way, so, it's not a group of stations, but a single station. 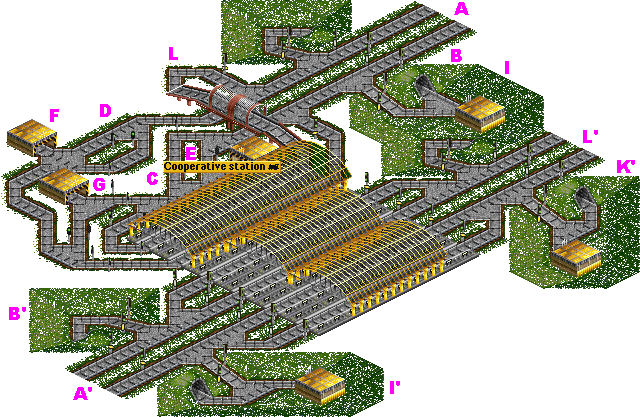 In contrary, cooperative station is a group of station, connected to different ways. Not only small stations can be used to build cooperative stations. For example, circular stations too. Let's find out, how does cooperative station works. At the schema 5.1 the cooperative station consists of a small station of alternative type (schema 1.6), connected to two-line way A, and a standard circular station (schema 4.3), connected to circular A'-L'. Trains routing at the station components is independently. Trains from A' go to station using line-changer B' and depot I'. Trains from A go to station using line-changer B, depot I in-lines C and D and depots E, F and G. While trains from two-line way and circular operate independently. The same way independently trains go from the station. Trains, coming from two-line way go back to two-line way, using buffer L, line-changer B and depot I (if neccessary), and trains coming from circular, go to circular, using out-line L' and line-changer K'. 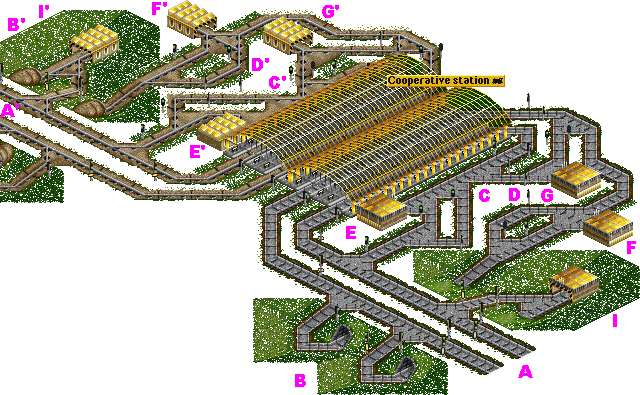 Cooperative stations can be also used in case of different track type. On the schema 5.2 there's represented a cooperative station wich consists of two small stations of alternative type (schema 1.6), connected to two-line ways A and A'. Trains routing at the station components is independently. Trains from A go to station using line-changer B, depot Im in-lines C and D and depots E, F and G. Trains from A' go to station using line-changerB', depot I' in-lines C' and D' and depots E', F' and G'. While trains from two-line ways operate independently. The same way independently trains go from the station. Trains, coming from the first two-line way go back to the first two-line way, using line-changer B and depot I (if neccessary), and trains coming from the second two-line way go back to the second two-line way, using line-changer B' and depot I'.